Yoga is a great way to cultivate a healthy relationship between your body and mind. It’s a wonderful way to help you keep fit, relieve stress, and ease your everyday stress experiences. It tones the muscles, increases flexibility, calms the mind and helps you to let go of stress as you create a strong and healthy body. 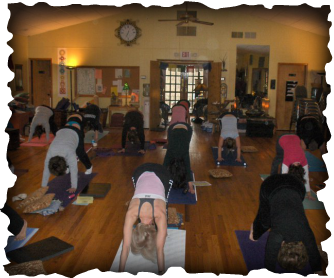 Wanda's beginner class a great way to learn the basics of yoga, improve flexibility of body and mind, and help you to relax into your body as you learn ways to ease the tension building in your muscles and joints without experiencing fatigue and overexertion. As you become familiar with the postures, both your yoga practice and your body will evolve in an inspirational and empowering way! You’ll notice results from your very first practice! The beauty of yoga is that anyone can enjoy its benefits—increased suppleness, more mobile joints, improved circulation— regardless of age or ability. The simple stretching involved in the poses and exercises of this yoga class will help you gain inner peace and bring radiant health! With this practice, you will learn your body's limits as you are guided through beginner poses (asanas) and breathing exercises (pranayama) to calm your mind and help put your body at ease! You will be guided through various levels of poses from the very basic beginner pose to a more challenging version for those folks who may wish to take a pose a little further. Throughout the class, emphasis is placed on safety, moving from core strength & alignment principles, with plenty of warm-ups woven into the practice. Students are encouraged to stay within their range of movement and comfort zone. Wanda ends each class with a soothing relaxation meditation that helps to relax the body and calm the mind. ​No experience needed! Everybody welcome!